Such a fitting start, the beautiful French macaron: two smooth and delicate meringue-like rounds flavored however the chef pleases, usually made in some beautiful pastel color that reflects the flavor, and sandwiched with some wonderful, complementary flavored filling between. They are generally made either as standard three inch rounds or small one inch miniatures. He has made them in raspberry, blackberry, pistachio, chocolate, and orange with various fruit or chocolate fillings. They are always sublime creations that disappear quickly. The outside of the pastry has a slight crispness to it, and a slightly soft moistness inside with the center filling always an irresistible match. 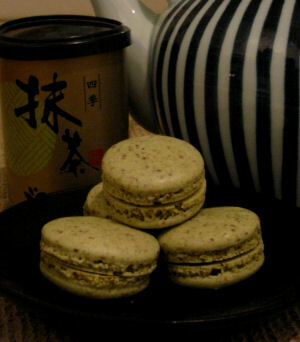 His latest creation is a very Japanese take on the macaron, a green tea, or matcha, flavored pastry with red bean paste, or an, filling. Place almond powder, powdered sugar, and matcha in a food processor. Process with metal blade until thoroughly combined. Fold almond mixture into egg whites in three additions. The mixture will deflate quite a bit. Continue folding until mixture is fully combined and shiny. 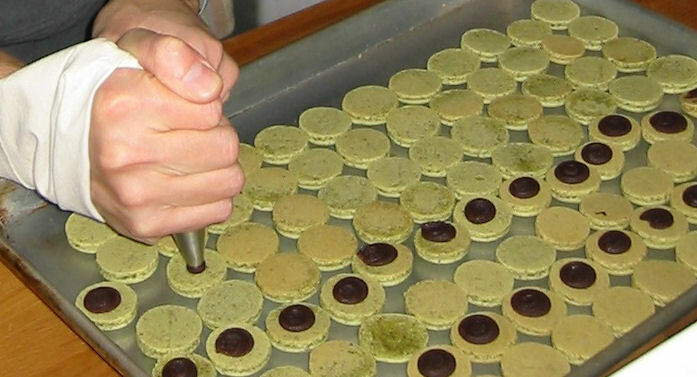 Immediately fill a pastry bag fitted with a 11mm round tip and pipe into rounds onto a baking sheet lined with a silpat baking mat. Move silpat to a cooling rack. 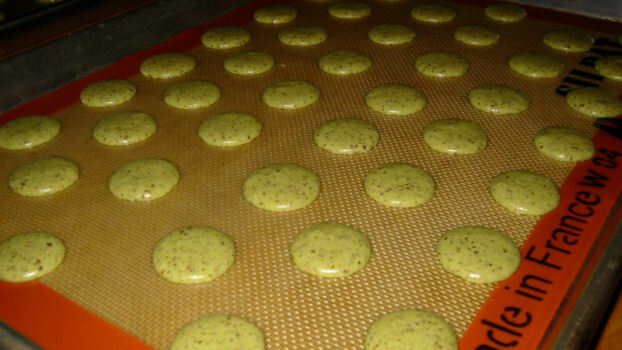 After macarons have cooled enough to touch, remove them from silpat and place upside down on rack.If they do not easily come off silpat, place in freezer for a few minutes and try again. 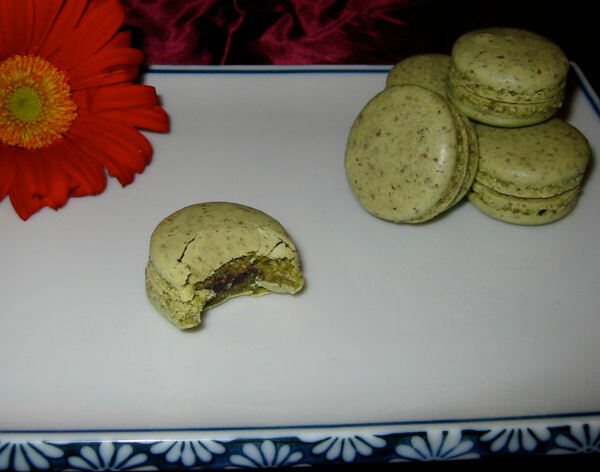 Sandwich macarons together with smooth red bean paste. Keep macarons in the freezer and serve chilled. 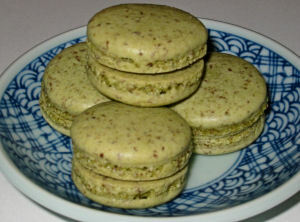 Macarons are best the day after baking, giving them time to dry out a bit. Makes about five dozen macarons. Macarons are a hobby of mine. I make the all the time. Maybe we’ll meet up someday and you can sample some. you made macaroons in san diego and didn’t offer us any!?! hmph! 😛 they definately look delicious.